An accurate diagnosis is critical for planning the best treatment approach for prostate cancer. 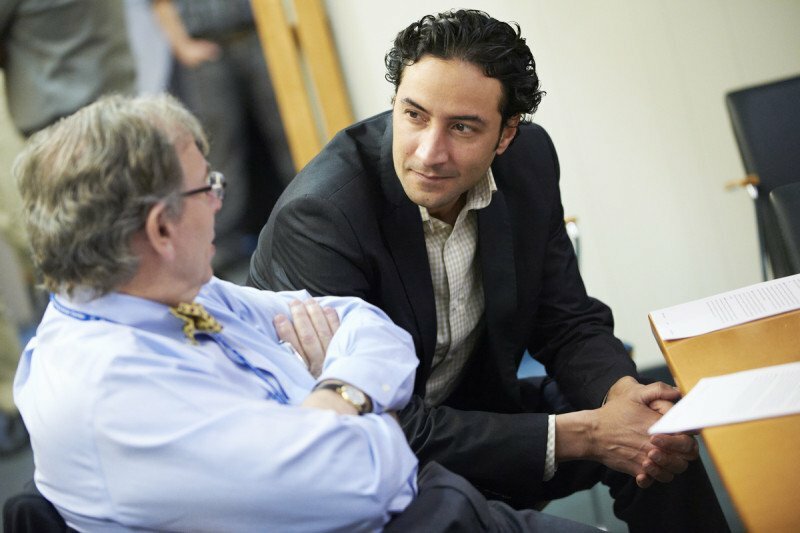 Here, pathologist Victor Reuter (left) discusses a patient’s case with surgeon Karim Touijer. We understand that a diagnosis of prostate cancer can bring with it a lot of anxiety and uncertainty. Our experts strive to give you the most accurate diagnosis possible using the latest technology. We want you to feel confident about your next step, whether it’s active surveillance for your disease or starting treatment. We offer the most-advanced detection tests to pinpoint evidence of the disease and determine whether it has spread outside the prostate. We can also help you better understand your risk for developing prostate cancer. Through our Patient-to-Patient Support Program, people who have finished cancer treatment are available to meet with patients who are currently receiving treatment. Biological molecules that provide a clear indication of disease, called biomarkers, are entering our arsenal of molecular tests to diagnose prostate cancer. New biomarkers are allowing us to more precisely detect prostate cancer, guide our decisions about treatment, monitor patients’ response to treatment, and track the progression of cancer. Our researchers and doctors are working to develop and evaluate the use of biomarkers in clinical practice. To better detect prostate cancer, our doctors are studying the use of advanced molecular testing. The 4Kscore Test is a blood test that delivers a patient-specific risk score for having aggressive prostate cancer. This test can help reduce the number of unnecessary biopsies by providing information to improve decision-making before ordering a prostate biopsy. The Prostate Health Index (phi) is a new combination of three blood tests that results in what is called the phi score. This score gives you more accurate information on what an elevated PSA level might mean for you and the probability of finding cancer in a biopsy. ConfirmMDx is a test performed on prostate biopsy samples that did not show cancer to determine if a repeat biopsy is warranted. Several genetic tests performed on prostate biopsy tissues, including Prolaris and Oncotype DX GPS, can provide a measure of the aggressiveness of your prostate cancer. Such tests may give both you and your doctor additional information about the true nature of the cancer. For men with advanced prostate cancer, our researchers are currently assessing the effectiveness of a blood test that may be capable of detecting a single prostate cancer cell among a billion or more healthy cells. Interest in these cells, called circulating tumor cells, has increased with the availability of new technologies to detect, count, and characterize them. This new liquid biopsy may offer a noninvasive, highly accurate way to find cancer cells that cannot easily be detected with current methods.